3D Printlife's specially formulated PLAyPHAb™ PLA/PHA blend delivers an upgraded PLA that makes standard PLA much less brittle. It is 100% biodegradable like PLA, but is comparable to ABS in terms of its impact strength with greater pliability and elongation at break. PLAyPHAb™ meets ASTM D6400 standards for biodegradability and maintains a dimensional accuracy better than +/- 0.03mm. 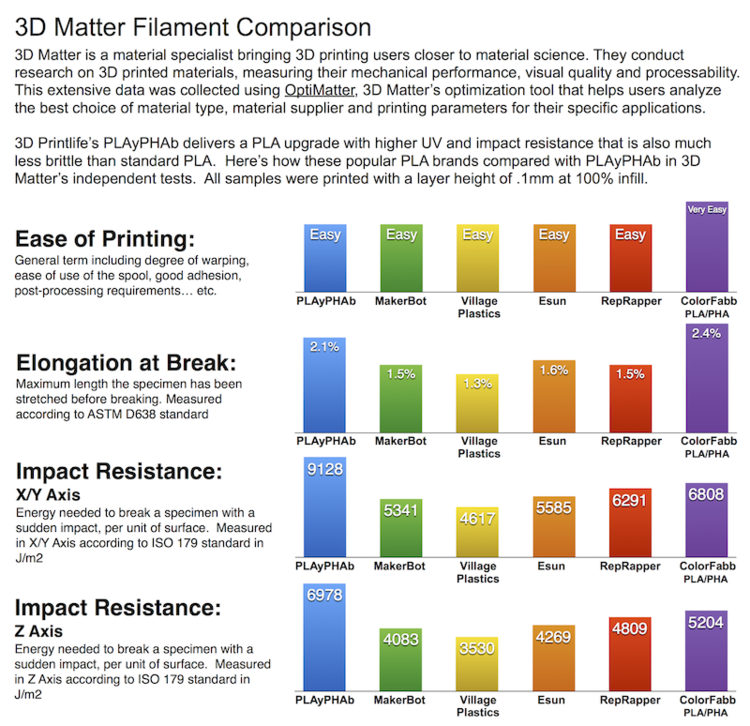 PLAyPHAb™ has greater UV and impact resistance than PLA, increased flexibility, excellent layer adhesion, produces a glossy finish, and once opened has a tremendous increase in shelf life compared to PLA. “We switched to PLAyPHAb for its consistency, flow rate, and because its shelf life is 10 times greater than standard PLA." PLAyPHAb™ is less stringy than PLA during print-head travel, and removing support structures is almost trivial and can easily be removed by hand. PLAyPHAb's added pliability makes it much easier to post process and it is even possible to drill holes in certain parts, which is a tremendous upgrade as drilling through PLA tends to cause parts to crack. Optimal print temp 210℃ - 250℃ with cooling fan, infill greater than 30%. In addition a portion of the proceeds from every spool of PLAyPHAb™ will be donated to environmental charity plant a tree. One spool equals one tree, rejuvenating iconic forests in key locations throughout the United States. PLAyPHAb™ is wound onto a heavy recycled cardboard spool that is biodegradable, and bound with a recyclable tin end cap. In fact the entire spool can be tossed directly into your recycling bin! The spool was designed for universal fit with most 3d printers in use worldwide. It includes both a cutout for viewing filament and dual puncture slots to secure filament when not in use. The flange can even rotate to in either direction to aid in securing the filament wherever it has been cut. Consumers can be confident that 3D Printlife's PLAyPHAb™ spool will be compatible with their printer. PLAyPHAb™ is made in the USA with the highest quality materials and extrusion processes available. Every inch of PLAyPHAb™ filament is measured to ensure that it is within the strictest standards for quality, diameter, and ovality. PLAyPHAb™ uses high quality 100% virgin resins and colorants in filament manufacturing. Each spool of PLAyPHAb™ is carefully wound to exacting standards to minimizing crossovers and loopbacks that can lead to snags and snaps.